Republicans on Capitol Hill might not be as united behind President Trump as they appear in the media, if anti-Trump Democrat Adam Schiff is to be believed. Appearing on HBO’s “Real Time with Bill Maher” on Friday night, the California congressman -- who chairs the House Intelligence Committee and has been a staunch critic of the president -- said his Republican colleagues privately support his investigations into President Trump&apos;s actions, but stopped short of naming names. At one point, host Maher asked Schiff if he ever talks with GOP lawmakers after-hours about what transpires in Washington. He responded by saying he and Republicans do “socialize,” but it&apos;s in their private conversations where Republicans tell him their “deep fears” and “misgivings” about the president. “People will stop me in the corridor, Republicans, and say, ‘Keep doing what you’re doing,’” Schiff said. “Really?” Maher responded, seeming surprised. “Senior Republicans, which of course would be heresy for them to say publically. He added: "I don’t need private confidence in misgivings anymore. We need public statements. We need people to take a stand. We need people to vote their conscience." Schiff expressed similar views in an "open letter" to Republicans that appeared Thursday on the website of the Washington Post. Fox News contributor Katie Pavlich, for one, wasn&apos;t impressed with Schiff&apos;s op-ed. 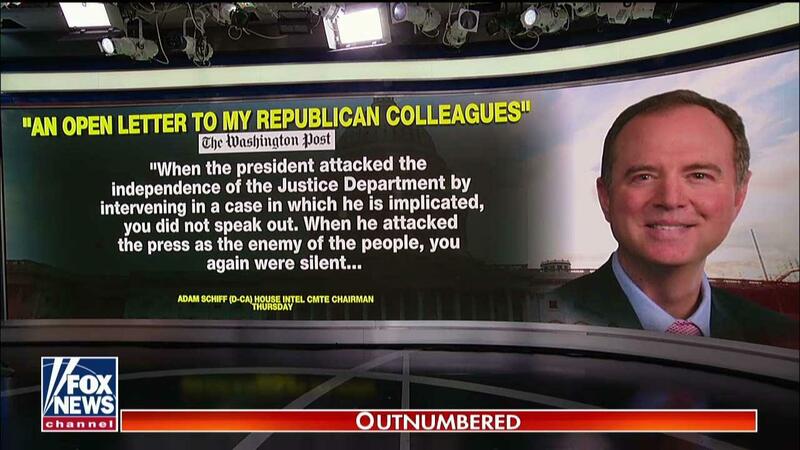 "For Adam Schiff to think that Republicans on Capitol Hill are going to be allies with him after everything that he&apos;s done and plans to do, I think that he&apos;s hoping for a little too much," Pavlich said on Friday&apos;s edition of Fox News&apos; "Outnumbered."